One of the biggest problems with the pocket computers was the place where to save programs. 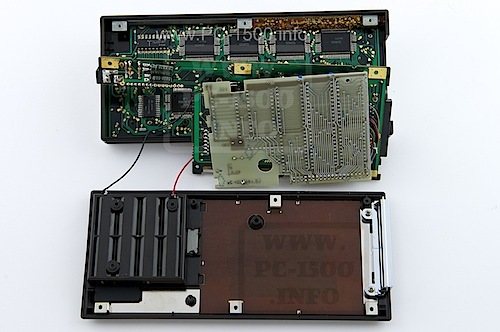 With the PC-1500 one solution was to get a big memory module like CE-161 or CE-163. The common system was the use of a tape recorder. But this was noisy and slow ! Reto and Thomas decided to design an interface between the PC-1500 and one product currently sold. Their choice was the Commodore floppy 1541. Maybe because it was packed with the power adapter ? And as they had enough space they added a 8bits parallel interface. There are quite a few owners of pocket computers that want a comfortable extension of your system. We present here an interesting interface. As we can see from our readers’ letters over and over again, there is still a great interest in pocket computers. Many owners wish to no longer separate from their fond devices or can acquire no larger computer system. Now the storage options for the small computers are quite limited, and the printer offered to satisfy any overly high expectations. That’s why we want to present them here an interface that is suitable for the Sharp PC-1500 (A) and in our opinion offers a super extension for computing dwarf. 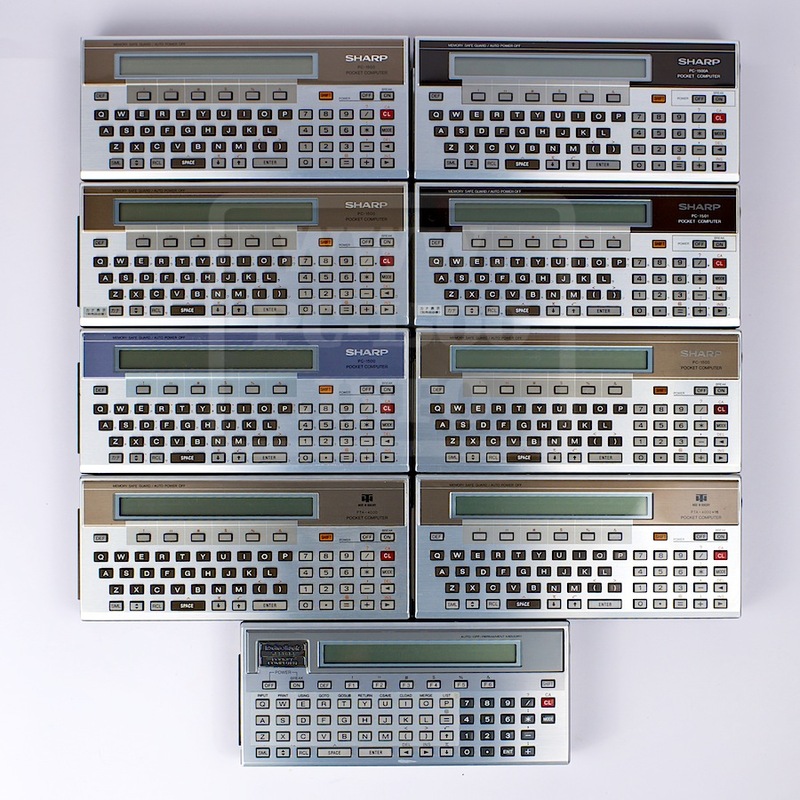 – It can be used as 16-bit parallel-lnput / output interface, wherein each pin may be configured as input or output. – It can be used as a Centronics interface to output data to a printer with a suitable interface. 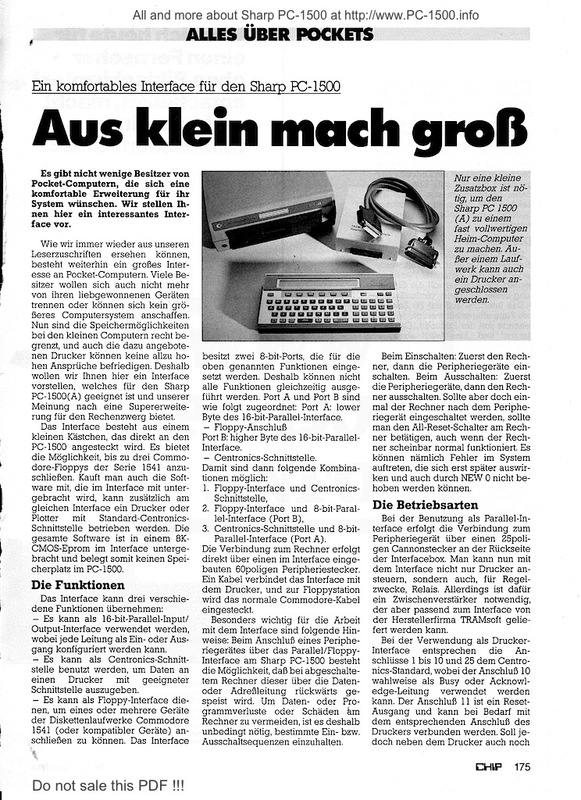 – It can serve as a floppy-Interface in order to connect one or more devices of the Commodore 1541 disk drives (or compatible device). The interface has two 8-bit ports that are used for the functions listed above. Therefore, not all functions can be performed simultaneously. Port A and Port B are assigned as follows: Port A: lower byte of the 16-bit parallel interface. Port B: higher byte of the 16-bit parallel-Interface. 1 floppy interface and centronics interface. 2-floppy interface and an 8-bit parallel-Interface (port B). 3 Centronics interface and an 8-bit parallel-Interface (port A). The connection to the computer is done directly via a built-in interface 60-pin peripheral connector. A cable connects the interface to the printer, and floppy station the normal Commodore cable is plugged. 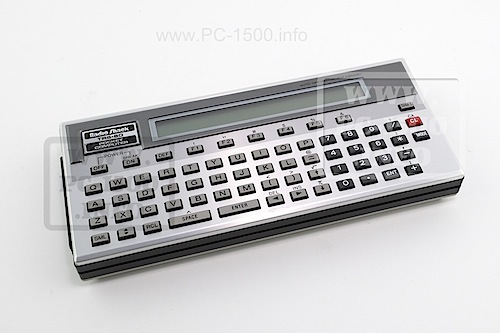 Particularly important for working with the interface are the following: When connection of a peripheral device via the parallel / floppy interface on the Sharp PC-1500 is a possibility that in this computer is off is powered by the data or address line backwards. To laughed envy data or program loss or damage to the computer, it is therefore absolutely necessary to comply with certain inputs or shutdown sequences. At startup: First, the computer, then turn on the peripheral devices. Power off: First, the peripherals, then turn off the computer. If, however, but once the computer after the peripheral device is turned on, you should press the all-reset switch on the computer, even if the computer appears to be working normally. Namely, errors occur in the system, the impact until later and can not be resolved by NEW 0. When using a parallel interface, the connection to the peripheral device via a 25-pin Cannon connector on the back of the interface box. You can now control the interface not only printers, but also, for control purposes, relay. However, for a repeater is necessary, which can be supplied fitting to the interface by the manufacturer but TRAMsolt. When used as a printer interface correspond to Ports 1 to 10 and 25 to the Centronics · standard, the terminal 10 either as Busy or acknowledge line may be used. The terminal 11 is a reset output and can be connected if necessary with the corresponding port on the printer. If, however, are also simultaneously connected a Run plant next to the printer, the terminals 13 to 21 may not be connected to the printer. The CONSOLE command, the row length, the end code and the active edge of the ready signal are determined. The parameter line length is determined by the number of characters an end code to be output at the latest. Permits are line lengths of 16 and 255 characters. With line length 0 arbitrarily long lines can be printed. The interface should be set to 80 characters per line, at the end of the line to the end code “Carriage Return” and “Line Feed” is displayed, and there are solos a printer connected to the busy signal. CONSOLE specifies the line length set the end code and the active edge of the Ready signal. LLIST lists the active program module via the Centronics interface. LPRINT outputs data via the Centronics interface. PROGRAM makes the specified program module is active. TAB determines the position of the next character to be printed. ZONE sets the block length for the data to be output via the interface which were separated by a comma in the LPRINT statement. The floppy drive is connected using the supplied cable Commodore. In contrast to working with the tape, a file name must always be specified here. When reading a file from the floppy, however, the file name is not displayed. The floppy-Parallel-Interface of TRAMsoft is a device that almost turns a pocket computer a full-fledged home computer. Easy to handle, it offers opportunities that significantly improves the performance of a Sharp PC-1500. And yet at a very reasonable price. 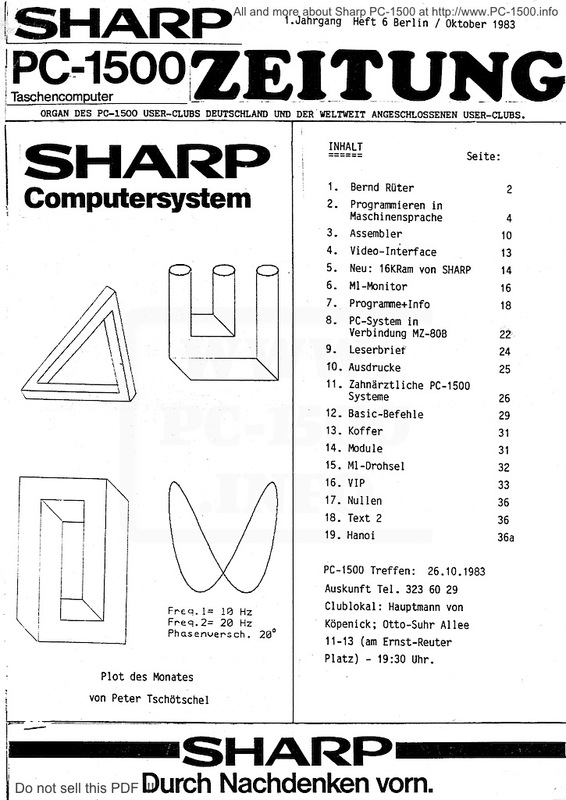 Only a small complementary box is needed to make the Sharp PC 1500 (A) to an almost full-fledged home computer. Except for a drive can also be connected to a printer. This entry was posted in Blog, Hardware and tagged 1541, commodore, disk, Floppy, save, tape on 09/24/2014 by Rom1500.